Clock is Ticking- Will You Take Action to Get Health Insurance Before January 31st? As a nationally recognized Champion for Coverage by the Department of Health and Human Services (HHS), LULAC National has played a critical role in addressing the health care needs of the Latino community. With the support of private and public sector partners, LULAC National has hosted health festivals in key states to bring health screenings to thousands of people and provide the community with information on the open enrollment process and health marketplaces. As the closing deadline for the current enrollment period on January 31st quickly approaches, LULAC National is working to support all health care enrollment activities in Latino communities across the country. Enrollment events are enrollment opportunities in local communities where uninsured individuals can get help to sign up for coverage, explore their options, and/or talk to health experts about health resources in their communities. Remember, you can sign-up for coverage before January 31st! Financial assistance is available to families who qualify. Enroll today! Wednesday, January 20 -3- 8:00 p.m.
Thursday, January 21 - 3- 8:00 p.m.
Enrollment assistance at the Creating Change conference, Chicago, IL. Phone Bank and Enrollment at Family Health Centers of Georgia with Omega Psi Phi Fraternity, Inc.
For additional events happening throughout the month of January, please visit Enroll America’s website to find an enrollment site close to you. Visit: https://www.getcoveredamerica.org/connector/. Remember, you can sign-up for coverage before January 31st! Financial assistance is available to families who qualify. Enroll today! 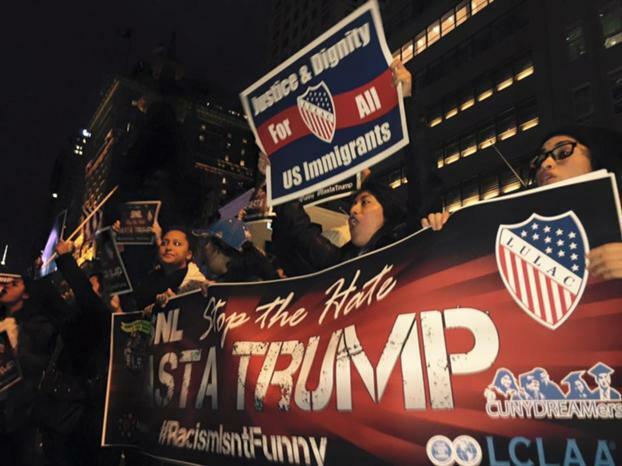 “¡El pueblo unido, jamás será vencido!” was one of the many chants shouted during the New York rally on November 4, 2015 in our efforts to protest Donald Trump hosting Saturday Night Live (SNL). A day before, the LULAC interns had been asked if we would like to participate in the rally, and without hesitation, I said yes. We prepared chants and posters and embarked on the four hour drive to New York from the LULAC National Office in Washington, D.C. This became one of the most memorable experiences at LULAC because it was my first time going to New York, and I was determined to let others know the problems with allowing Donald Trump on SNL after his disparaging comments about the Mexican community. Last summer, Donald Trump had the audacity to describe Mexicans as criminals, drug dealers, and rapists. This is a grave misrepresentation of the Mexican community because the majority are hard-working people who immigrate to the United States in hopes of improving their lives. In addition, the undocumented community contributes immensely to the economy of the United States. Donald Trump has proposed building a wall that will stop immigrants from entering the United States and deport the 11 million undocumented immigrants that already reside in the country. However, deporting immigrants will result in adverse impacts on the economy. Instead of moving forward with immigration reform, Trump wants to dismantle all the work that has arduously been fought for to ensure immigrants have rights in this country. Although we were a small group, it was truly beautiful to see all the interns passionately chanting the night of the rally. Our energy was enough to let others know that we will not tolerate the comments of people like Donald Trump, and much less his presence on a show that so many Americans watch. It is unacceptable to give airtime to someone who makes derogatory comments about the Latino community, especially now that we are one of the fastest-growing demographic groups in the United States. Because of our rapidly-growing numbers, it is imperative that we register Latinos to vote in the 2016 presidential election so we can voice our opinions. I cannot emphasize enough the importance of voting and actively participating in elections, where we the people have the opportunity to elect our representatives. As a Democracy intern, I had the opportunity to directly work with the community through voter registration efforts. I was happy to partake in these efforts because for me, it is important to ensure that the Latino community registers to vote. As a first generation Latina who immigrated to the United States from El Salvador at a young age, I acknowledge the privilege I have to be able to participate in elections. Unfortunately, most of my family cannot vote in the United States, so the burden falls on me to represent them, and participate in elections. Attending the rally in New York hit home for me because I was not only representing LULAC and myself, but also my family and the Latino community. I believe that it is vital to organize, protest, rally, and vote to ensure that our voices are never silenced. Although Donald Trump was still the host on SNL, the interns and I highlighted how insensitive it was for SNL to invite Trump as a host. I learned that it is not always about winning, but accomplishing something small that can ultimately lead to bigger things. Through my participation in the protest, I hope to have encouraged more Latinos to take action and go out and vote in the 2016 presidential election.